Nearly everyone agrees that sugar is poison. 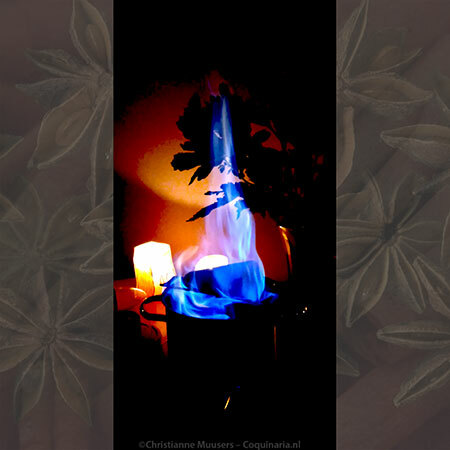 However, it is only considereda poison because it is used in excess. We all love sweet dishes, and the food industry uses it as a flavour enhancer as well. But a long time ago sugar was actually welcomed by physicians and scientists as a panacea for all kinds of illnesses. Yes, sugar was considered to be very healthy! In an article I wrote for a yearbook for the Dutch historical association De ghulden roos in Roosendaal (see bibliografie) I published a recipe for ‘sugar soup for the sick’ from a tenth-century Arab cookbook. It tastes like an antibiotics medicine for children (sweet), but without the antibiotics. Naturally it didn’t take long for people to consume sugar-sweetened dishes just because they enjoyed it. Sugar became a spice, mentioned in recipes along with pepper, ginger and nutmeg, and it was often used in approximately the same amounts as these spices. 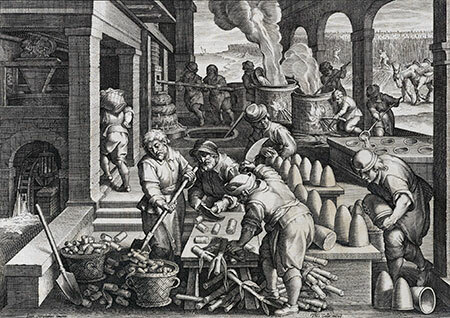 In the sixteenth century sugar was sold by apothecaries, but the profession of confectioner was already on the rise. Sugar became a drug, taken for pleasure, and it is still the same today. Sugar cane grows in a tropical climate and it originates from South-East Asia. The process of winning crystallized sugar from the canes was discovered in Northern India. The knowledge gradually spread westward, first to the Islamic world, and from the fifteenth century onward also among Europeans, for example on Cyprus. Making sugar from sugar canes is a very labour intensive process that was executed by slaves who came from the Black Sea area. 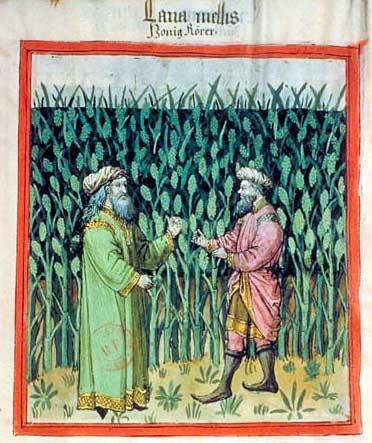 Because the demand for sugar kept growing, Europeans started cultivating sugar cane in colonies with the right climate. Labour was done by an ever growing number of slaves, now being transported there from Africa. In the bibliography is a link to books on this subject for those who would like to know more about it. The picture on the right is one from the series Nova reperta (New inventions, 1590) from the Flemish artist Jan van der Straat (source). It shows the different stages of sugar production, from stripping the harvested sugar canes on the left to the finished sugar loaves on the right. These sugar loaves are hard, and the sugar that is needed for cooking must be broken off with nippers and smashed with a hammer or grated on a special sugar grater. Beet sugar is a relatively recent arrival in culinary history. During the seventeenth century there were already experiments with making sugar from beets, but this did not become viable until the Napoleonic Wars when the French emperor blocked the import of cane sugar. In the nineteenth-century cookery book De hedendaagsche kookkunst (the art of modern cooking) by Maria Haezebroek (ninth edition, 1892) there is a chemical test the housewife can do to find out whether she has bought ‘colonial sugar’ or inferior ‘beetrootsugar’, using indigo carmine. While preparing older recipes it is not necessary to use cane sugar is that is not readily available, because there is no real difference between fully refined cane sugar and beet sugar. The white sugar crystals are chemically the same, but if you opt for fully refined sugar it will be cane sugar. The golden and brown sugars of Tate & Lyle show that the ‘impurities’ left in the sugar can add something spicy to the taste. The original Arab cookery book is titled Kitab al tabikh, which literally means ‘cookbook’. The text I used is from the translation by A.J. Arberry (see bibliography). The recipe is in a chapter for al kinds of khabis (puddings), but when I make it it turns out more like candy. The first recipe of the next chapter is a ‘Halwa yabisa’, a sweetmeat of pulled sugar (see this short film – 18 seconds – I made of a confectioner pulling sugar in Confiserie Zucchero in Bruges, Belgium). More information on the cookery book is available on the page with the recipe for meatballs in eggplant sauce. Khabîs al-lauz. Take one ratl of peeled, ground sweet almonds and three ratls of sugar. 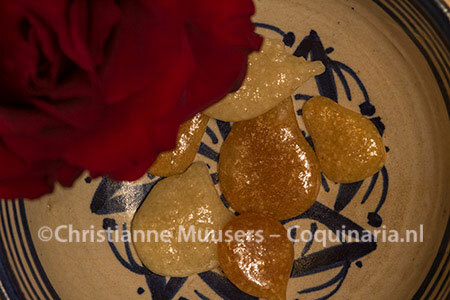 Put the sugar in a dish and dissolve, with two uqiya of rose-water. When the sugar is dissolved and has begun to set, add the ground almonds, and stir until done. Serve out, coating under and over with fine-ground sugar. This may also be made with flour: put with the ratl of sugar two uqiya of flour, then proceed as above. I am not a professional confectioner, so I am sure that real professionals might disagree with my adaptation of this recipe. Given the relative proportions of the amounts of sugar and liquid, the result of the recipe will be a candy. Depending on the temperature to which the sugar is heated during the preparation you will get a hard or a soft candy. The tartaric acid I mention in the recipe is not used in the original recipe. 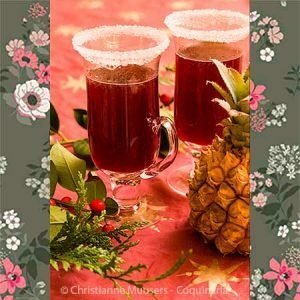 It will add a little tartness, and it will also prevent crystallization of the concoction. Makes about 100 small candies; preparation in advance 5 minutes; preparation 20 minutes + pouring. Sift the ground almonds to remove the larger bits. Heat sugar, tartaric acid and rose water in a small pan to 112.5 °C/234.5 °F for soft candy or fondant, or 122 °C/251.6 °F for hard candy. Use a candy thermometer or an infrared food thermometer (that is what I used) to check the temperature. As soon as the sugar syrup has reached the desired temperature, add the almond flour. Stir well, and heat for five more minutes. For darker candy, the sugar syrup has to caramelize slightly before adding the almond flour. The syrup will become even hotter, but I did not measure the temperature and worked on sight. Pour the sugar-almond mixture on a silicon sheet or a sheet of baking paper and let it cool down. Once cold, break or cut it in small pieces and keep it between sheets of baking paper. When exposed to the air, the candy will become sticky. When using a teaspoon to drop the sugar-almond mixture on the sheet, these will solidify in round candy, but this has to be done very quickly. When the mixture cools, it will become too stiff. The candy in the picture were made this way. This is a candy. Eat it when you would eat a candy, or serve it after a meal with spiced wine. The different colours of the candy on the picture is the result of different temperatures. During the second batch the sugar was lightly caramelised. In a more recent translation of the Baghdad cookery book Charles Perry uses ‘pound’ and ‘ounce’ for ratl and uqiyya, and that is about right. There are 12 uqiyya in a ratl, just as there are 12 ounces (ca 37 gram) in a pound (ca 450 gram). The exact value of a ratl could change, depending on location and period, but the ratio would remain the same. This is a natural substance that is present in, for example, grapes, bananas and tamarind. 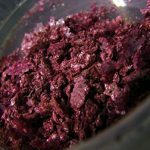 The Dutch name wijnsteenzuur (‘wine crystal acid’) comes from the ability of tartaric acid to form crystals in wine with kalium. In Europe it is mentioned on food labels as E334. It is used as antioxidant to prevent discoloration of food for one thing. Tartaric acid is also used in some medication, disinfectants and cleaning agents. It can be bought in the form of white crystals like sugar and salt. So be sure to put a very clear label on the container! Tartaric acid is also a catalyst that helps forming fructose and glucose from sucrose (invert sugar), and prevents crystallisation in sugar syrup. A.J. Arberry, A Baghdad Cookery Book (Kitāb al-Ţabīkh) (Islamic Culture XIII 1939), herdrukt met commentaar van C. Perry in Medieval Arab Cookery (M. Rodinson en C. Perry), Prospect Books, 2001. C. Perry (vert. ), ‘A Baghdad Cookery Book’. Petits Propos Culinaires 79 (November 2005). M. Rodinson, ‘Studies in Arabic manuscripts relating to cookery’ in Medieval Arab Cookery (M. Rodinson and C. Perry), Prospect Books, 2001, pp. 91/163. Books on sugar and slavery on Amazon.